Last week, when it seemed like all of Manhattan packed their bags and skipped town, I did the most brilliant thing: set aside an hour, tucked my phone deep into the bottom of my bag, and took a slow, deliberate walk through our neighborhood to enjoy the final hours of the year. 2013 was a year full of change for us. When I think back on it, nearly every month brought something new to our shared horizon. Some of these changes were positive. Others were negative. Some I'm still busy trying to sort out in my head. It was a year of movement, of rushed decisions, of shouting and over-thinking and celebrating. Mostly, though, it was a year of constantly looking ahead, of forgetting the present moment and worrying about the future and praying that everything would work out in the end. 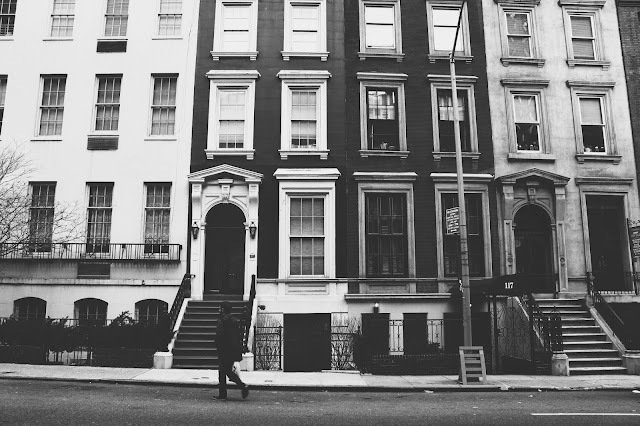 When I was twenty-two, I took my first job in the city at a small publishing house in Chelsea. I hated it. The hours were long, the paychecks were small, and the work involved shuffling papers to and from different desks and running errands for the publisher's dog (that's another story for another day). But I kept the job, rationalizing that it gave me a reason to be in New York, a purpose for staying there other than simply indulging a dream. In retrospect, the only thing I really liked about the job was the lunch break I took each afternoon (I probably should have been busy working at my desk, but that's in the past). On most days, I spent the entirety of those lunch breaks walking, desperate to escape my desk and to absorb the sights of the city that was still so unfamiliar to me, and yet that I loved so much. I took time to slowly walk through Union Square, studying all the changing bins of produce at the Green Market. I walked and analyzed the way more seasoned city dwellers carried themselves, tucking their copies of the Times beneath their arms as they hustled across the crowded crosswalks (that was a decade ago, back when people still read print). 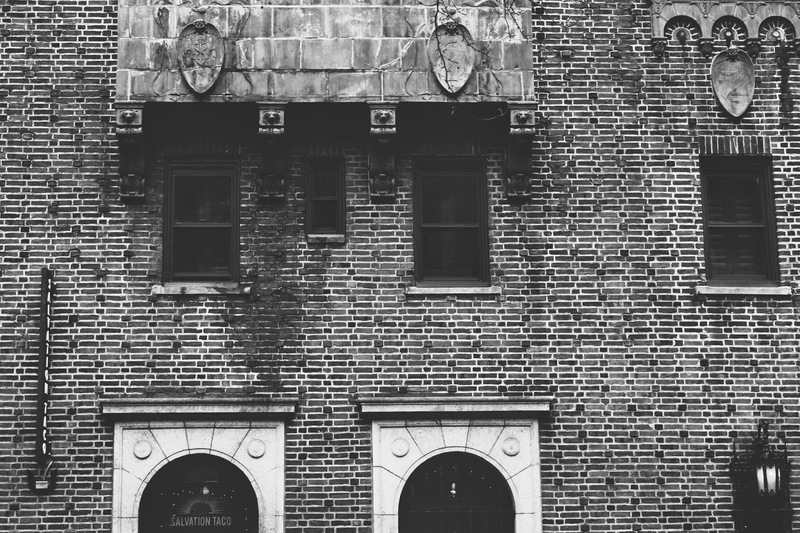 I walked and allowed myself to get lost, periodically stopping to peek at a playing card-sized map I kept in my coat pocket, desperate to memorize the names of all the city's different neighborhoods, and the various streets that marked where one ended and another began. 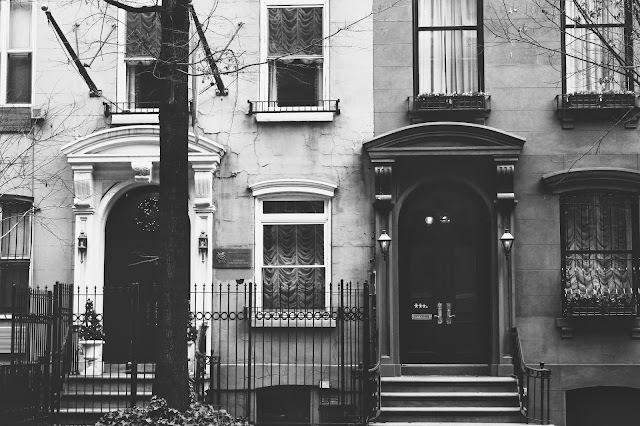 In my favorite essay, "Goodbye to All That," Joan Didion writes, "It is often said that New York is a city for only the very rich and the very poor. It is less often said that New York is also, at least for those of us who came there from somewhere else, a city only for the very young." Looking back, it's hard to believe I was ever so young. While I would never pray to be that naive or unconfident or underpaid again, I do envy my twenty-two year old self. She took things a lot slower. Everything felt so new to her, so alive. 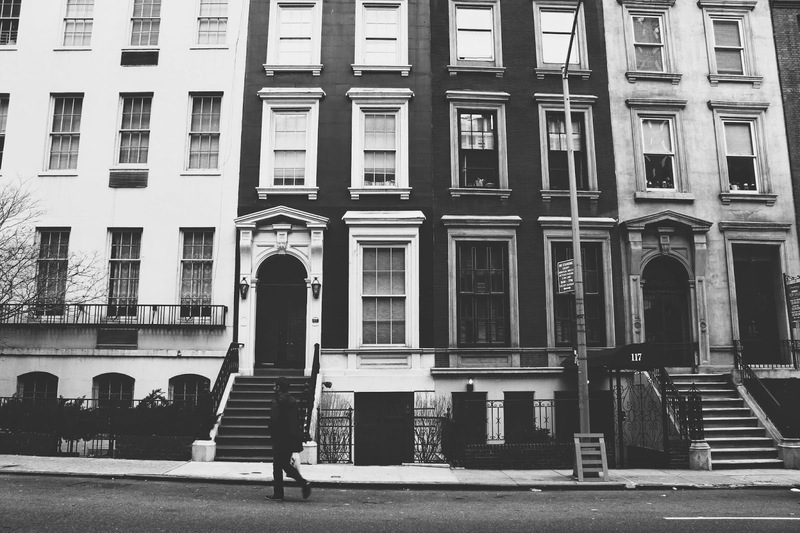 She rarely fretted about money or the future, not during those long, slow walks, anyway. Instead, she chose to abandon worry and simply take in the living postcard that took place all around her. I tried to summon that old, familiar feeling during my walk last week. While I should have been busy sending out tweets about our daily menu, or panicking about our already overwhelming to-do list for the year ahead, or fretting about a million other possible things, I just walked instead. Maybe it was the strong winter sun and the way it cast a beautiful combination of shadows and light across everything. Or the fact that I was feeling nostalgic about the end of one year and the start of a new one. But, all around me, everything looked vibrant for the first time in perhaps too long. I have no doubt that 2014 will continue to be a year of change. After all, if things aren't changing, then we're not really making progress, not really growing or challenging ourselves. But I'm hoping that, with all the change that is hopefully coming our way, I can learn to look ahead a little less and to live in the present just a little bit more. These preserved lemons are my first new recipe of the new year. I figured they'd be a good one to start things off right, mainly because they require patience (once the lemons are prepared, they'll need to sit in a glass jar for a good month). But, like so many things, they're worth the wait. 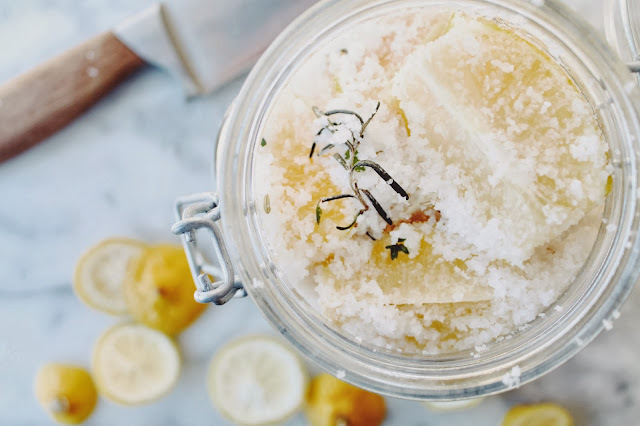 The final preserved lemons are like a refreshing, intensely lemony palette cleanser after a long December filled with chocolates, fatty meats and tins filled with sweets. 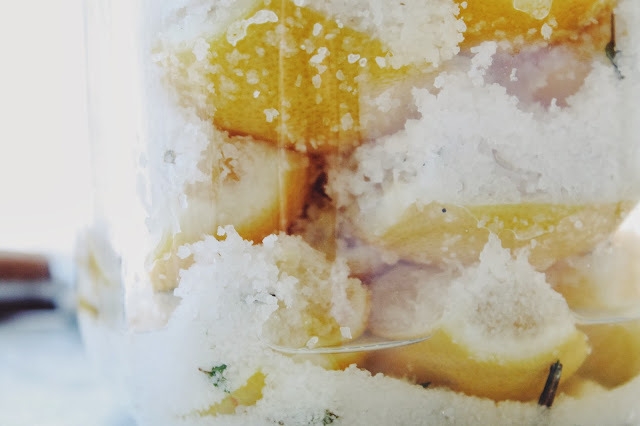 When they are ready, and you rinse off the salty brine, the vibrant and tender rind that you are left with, which you can chop up and add to nearly any dish, will uplift even the most common recipe into something decidedly fresh and new. Happy New Year all! Combine the salt, sugar and herbs in a medium-sized bowl (be sure to remove the herbs from their stems; you can roughly chop them if you like, though I left my in tact). Set aside. 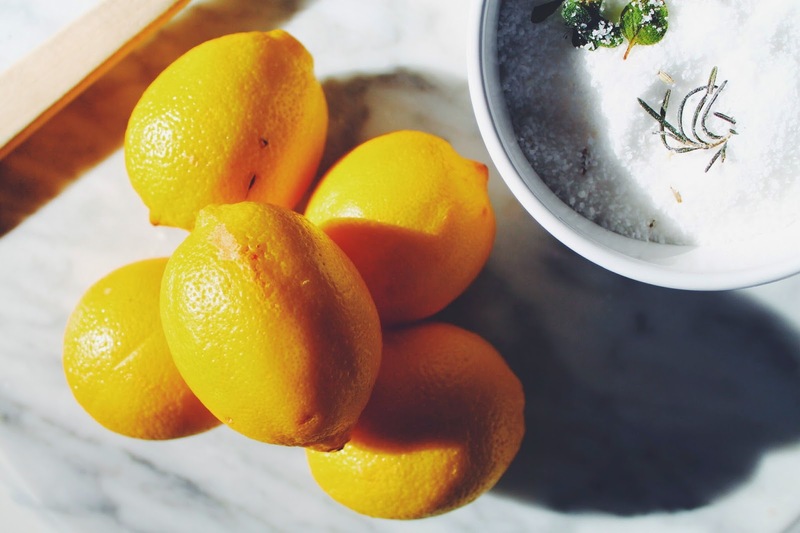 Scrub the lemons with a vegetable brush in an effort to remove any wax (since you'll be eating the rind). Cut the ends off the lemons and then slice each lemon into 4 wedges (reserve one lemon for squeezing). Using the tip of a sharp knife, remove any seeds from the fruit's flesh. Add the lemon wedges, a few at a time, to the salt mixture, being sure to thoroughly coat both the flesh and the rind. Cover the bottom of a clean glass jar with a coating of the salt mixture. 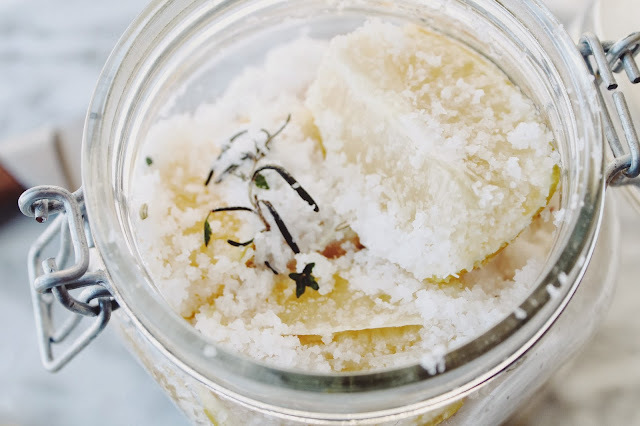 Add a layer of lemon wedges to the jar. Top the layer of lemon wedges off with a good sprinkle of the salt mixture. Repeat this process until all lemons are tightly packed in the jar. 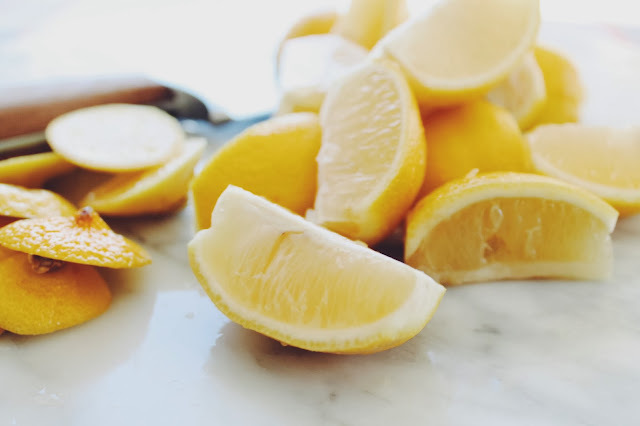 Slice the reserved lemon in half, remove any seeds, and squeeze the juice from the lemon into the jar. 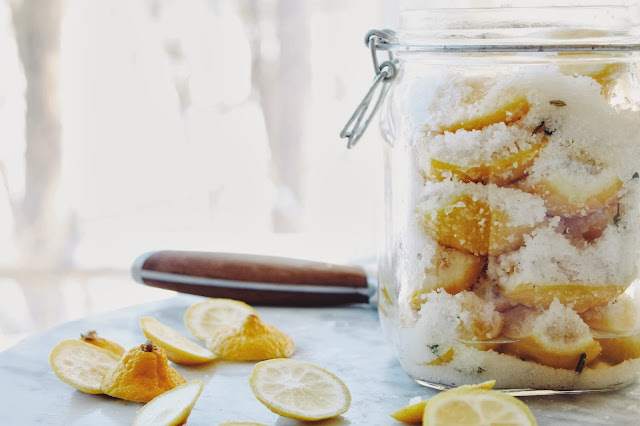 Top the jar off with any remaining salt mixture (if you've used it all, simply add a good shake of plain kosher salt, being sure to completely cover the fruit). Set the sealed jar in a cool place for 4-5 days (give the jar a gentle shake once or twice a day). At this point, the jar should be filled with a good amount of lemon juice (if it is not, you can simply add some). Move the sealed jar to the fridge, and keep it there for one month before using the preserved lemons. When you are ready to use the lemons, remove the wedges from the jar and rinse off the salt. Both the rind and the pulp are delicious. Place the sealed jar back in the fridge, where it will keep well for about 6 months. love your post and also preserved lemons. i too was young in nyc ages ago working in fashion and then magazines for too small a paycheck, and walking and walking, everything was fresh and glamorous back then.